Pigs are highly intelligent, curious animals capable of performing complex tasks and forming elaborate, cooperative social groups. Despite what many of us have been brought up to believe, pigs are naturally very clean animals. They designate discrete sites for defecating and urinating far from their sleeping and feeding areas. Near their nests, pigs often have rubbing sites, usually trees, which they use to aid in grooming when other pigs are not present to assist them. They regularly bathe in water and wallow in mud in order to prevent heat stress. The mud covering their bodies also offers protection from flies and helps to prevent sunburn. Despite the commonly used expression "sweating like a pig," pigs do not have sweat glands and can be prone to heat stress, so wallowing is very important for maintaining body temperature. On colder days, pigs may reduce their foraging activity to conserve energy. Being vulnerable to hypothermia, pigs instinctively huddle together to stay warm as young piglets and maintain this behavior through adulthood. Pigs belong to relatively stable social hierarchies, which play an important role in self-regulating behavior and maintaining group harmony. Whereas unfamiliar pigs who are intensively confined and crowded in industrial operations will engage in aggressive behavior, in the wild, pigs are naturally gregarious animals and the members of the groups maintain close contact at all times, often engaging in such social behaviors as huddling and grooming. They sleep in communal nests that adults help to maintain by adding fresh bedding materials such as branches and grass. 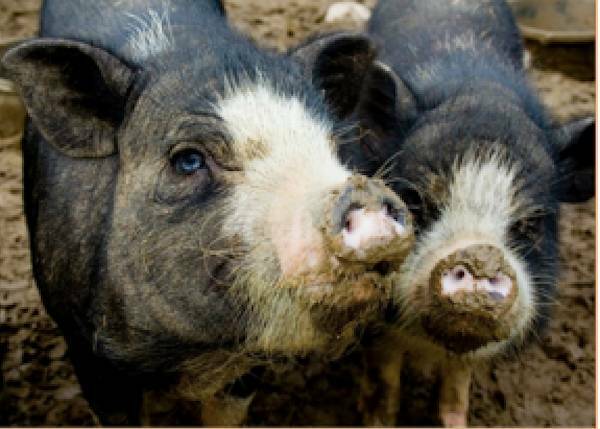 Pigs greet one another energetically and by making contact with their snouts. While foraging or exploring, they stay in contact through constant vocalization and are always aware of each other's actions, often learning by watching others' behaviors. Social recognition, or the ability to identify familiar individuals, is a key to forming stable relationships. 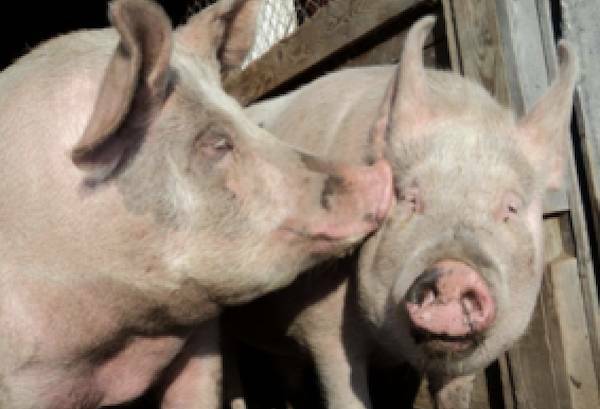 Pigs have strong capacities for identity recognition and social organization, and recognize other pigs primarily by their powerful sense of olfaction (smell), much as humans rely on visual cues to distinguish between friends and strangers. Pigs also utilize visual cues for social recognition, but with their powerful and heightened olfactory and auditory senses, they have other ways of communicating that are beyond a human's capacity for perception. 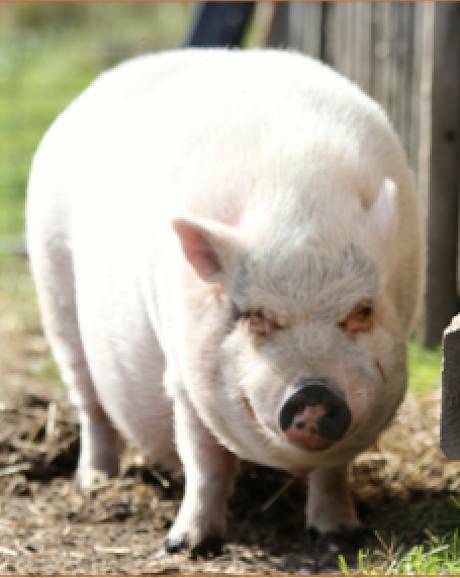 For example, pigs have well-developed hearing and vocal abilities. Their large, pricked ears act like radar dishes and can localize sound to a threshold of just 4 degrees, making them, like cats, one of the most accurate localizers of sound in the animal kingdom. They can distinguish between very subtle differences in tone and are known to use more than 20 different types of vocal noises to communicate during feeding, courtship, exploring, and other social activities. With these vocalizations, which include grunts, squeals, and growls, pigs are able to communicate to others such information as their location, mood, well-being, and intent. As you can tell, pigs are highly intelligent animals with a unique capacity for sustaining and enjoying their existence. If I may, allow me to get a bit more up close and personal regarding these non-human animal treasures. I have been visiting the sanctuary for about seven years. I visit with all the animals with each of these visits. All our sanctuary animals have the propensity to feel the energy we carry with us on any given day. That is one of their numerous gifts they offer us. The pigs are second to none in what they see in us and how they react to us. They have sat gently with me when I needed that gentleness. They have played with me when I needed to play. They have listened to me when I needed to speak. I have had many a prolonged conversation with Duncan, while he just patiently stood next to me, looking directly into my eyes, as if to say, "I'm here, I'm listening, and I understand." In the words of Sir Winston Churchill, Britain's famed prime minister, who was quite fond of pigs, "Cats look down on you; dogs look up to you; but pigs look you in the eye as equals."